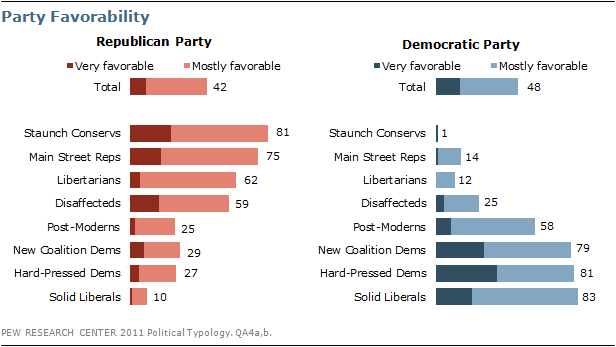 The typology groups divide sharply along partisan lines in their views of Barack Obama. The core Republican groups and GOP-oriented independent groups are highly critical of Barack Obama and would prefer to see a Republican defeat him next year. Democratic and Democratic-leaning groups largely support the president and favor his reelection. Opinions about some other political matters are less clear-cut. At this early stage in the Republican nomination contest, there is no clear favorite among any of the GOP typology groups. And the Republican groups’ views of the Tea Party are far from uniform: The Tea Party draws extensive support from Staunch Conservatives, but that is the only typology group in which a majority agrees with the Tea Party. Nearly all (97%) Staunch Conservatives say they disapprove of Barack Obama’s job performance, with the vast majority (84%) saying that they disapprove strongly. Main Street Republicans are also critical of Obama, but this group’s disapproval is less pronounced – 65% disapprove, including a slim majority (51%) who do so strongly. 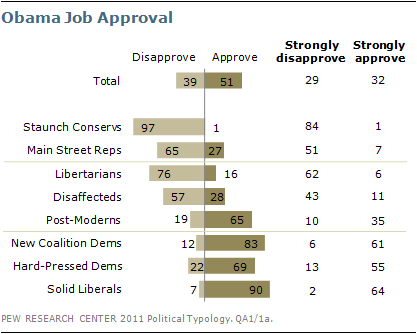 About a quarter (27%) of Main Street Republicans approve of the job Obama is doing. Notably, more Republican-leaning Libertarians (76%) than Main Street Republicans (65%) disapprove of the way Obama is handling his job. Disaffecteds are the group most divided in their assessments; this Republican-leaning independent group disapproves of Obama by about two-to-one (57% to 28%). Obama’s strongest support can be found among two of the core Democratic groups: Solid Liberals (90% approve) and New Coalition Democrats (83% approve). Nonetheless, there is far more intense opposition to Obama on the right than there is strong support for him on the left. Whereas 84% of Staunch Conservatives say they strongly disapprove of the way Obama is handling his job, a more modest 64% of Solid Liberals strongly approve. Hard-Pressed Democrats also approve of Obama’s job performance, but are more muted in their assessments (69% approve, 55% strongly). Nearly two-thirds of Post-Moderns (65%) approve of Obama’s job performance and 35% strongly approve. In the 2012 presidential race, Barack Obama holds a 47%-to-37% lead over a generic Republican opponent among all registered voters, and preferences largely mirror Obama’s overall job approval ratings. A year-and-a-half ahead of Election Day, nearly every group either solidly backs or opposes Obama by substantial margins. Solid Liberals are Obama’s strongest supporters: 95% say they would like to see the president reelected. Obama also enjoys overwhelming support from the other majority Democratic groups (78% among Hard-Pressed Democrats and 75% among New Coalition Democrats), and substantial support among the Democratic-leaning Post-Moderns (60% reelect Obama, 16% prefer a Republican). Staunch Conservatives support a generic GOP candidate by about as wide a margin as Solid Liberals back Obama; 91% support a Republican candidate. Somewhat smaller majorities of Main Street Republicans (73%) and Republican-leaning Libertarians (70%) also prefer a Republican over Obama. The GOP-oriented Disaffecteds favor a GOP nominee over Obama by roughly two-to-one (48% vs. 22%). But there is one key independent voting bloc that has moved more firmly into the Republican camp since 2008: Libertarians. This group backed McCain over Obama by a 39-point margin in 2008 (53% to 14%), but prefer a generic Republican over Obama today by a 63-point margin (70% to 7%). In the race for the GOP nomination, several of the leading Republican contenders fare well across most –but not all – GOP groups. Mitt Romney’s weakest support is among Disaffecteds, while Libertarians are less likely than other groups to back Mike Huckabee or Sarah Palin. Newt Gingrich does his best among Staunch Conservatives but his support wavers within other groups; and support for Ron Paul is concentrated among Libertarians. While Staunch Conservatives are the most firmly committed to voting Obama out of office, they have yet to agree on a preferred candidate: 22% say Huckabee would be their first choice, 20% Romney, 18% Gingrich, and 13% Palin. Palin and Gingrich garner less support among Main Street Republicans, 24% of whom name either Romney or Huckabee as their preferred nominee at this point. To win in 2012, a Republican nominee will need to reach beyond these base groups and appeal to the Republican-leaning Libertarians and Disaffecteds as well. No GOP candidate at this point has broad appeal among both of these voting blocs. 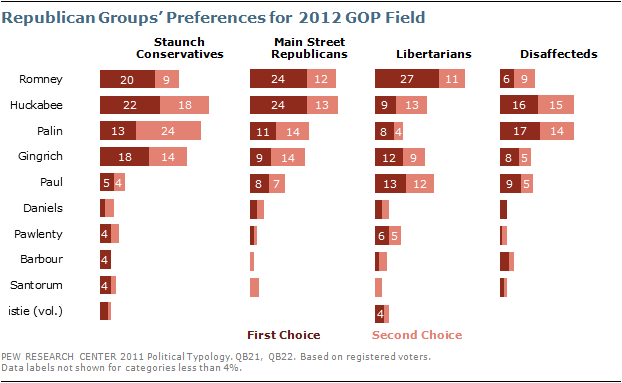 Romney leads among Libertarians (27% first choice), with Ron Paul also garnering significant support. By comparison, Disaffecteds prefer Palin or Huckabee over Romney and other potential Republican candidates. The Tea Party elicits strong reactions from the typology groups at either end of the spectrum: 72% of Staunch Conservatives agree with the Tea Party, while 67% of Solid Liberals disagree. 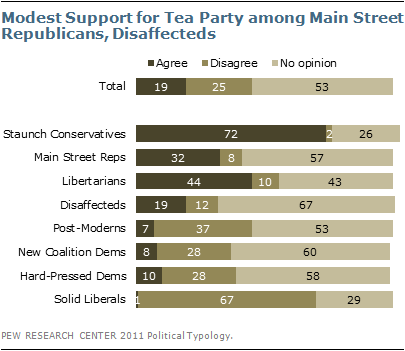 Among other groups, opinions about the Tea Party are more mixed. This is the case even among other Republican and GOP-leaning groups: the Tea Party draws support from fewer than half of Libertarians (44%) and Main Street Republicans (32%), and very few Disaffecteds (19%), who were a critical component of the GOP’s 2010 victory. Aside from Solid Liberals, most of those in the other Democratic and Democratic-oriented groups express no opinion of the Tea Party. Among those who do, the balance is much more negative than positive. When it comes to opinions of Barack Obama, George W. Bush and Bill Clinton, the clearest differences across typology groups fall out along partisan lines, with views of Barack Obama and George W. Bush particularly polarized. Notably, Democratic and Democratic-leaning groups view Obama and Clinton similarly, while Republican and Republican-leaning groups have more positive views of Clinton than they do of Obama. Staunch Conservatives and Solid Liberals stand out for their diametrically opposed opinions about Obama and Bush. While about nine-in-ten Solid Liberals view Obama (93%) favorably, just 7% have a favorable opinion of Bush. Conversely, 84% of Staunch Conservatives rate Bush highly and only 7% have a favorable view of Obama. Clinton performs slightly better among Staunch Conservatives (26% favorable); still, he garners his lowest ratings from this group. 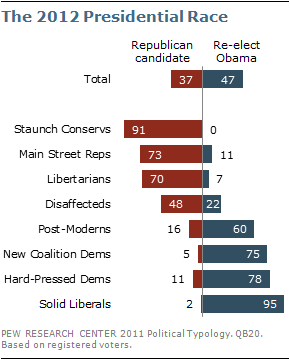 Main Street Republicans and Libertarians have less positive views of Obama than Clinton. In each group, about a quarter view Obama favorably, while roughly half view Clinton favorably. Large majorities of Main Street Republicans (77%) and Libertarians (67%) view Bush favorably. Although Obama does better among Disaffecteds than among other groups in the Republican coalition, just 35% of Disaffecteds have a favorable opinion of the president. By comparison, six-in-ten (60%) view Clinton favorably and 52% have a positive opinion of Bush. Both Obama and Clinton are seen positively by three-quarters or more of Post-Moderns, New Coalition Democrats and Hard-Pressed Democrats. About three-in-ten Post-Moderns (31%) and New Coalition Democrats (29%) view Bush positively. Hard-Pressed Democrats are more negative toward Bush: Just 18% give him a favorable rating. As they have for the last two years, Americans continue to view Michelle Obama positively: 69% have a favorable opinion, 21% an unfavorable one. But among the typology groups, there is one group – Staunch Conservatives – in which opinion runs the other way. Just 22% of Staunch Conservatives view Michelle Obama favorably, while 68% say they have an unfavorable opinion, including 43% who say they have a very unfavorable opinion. Among each of the other Republican and Republican-leaning groups, only about half as many offer an unfavorable opinion of the first lady. Nearly all (96%) Solid Liberals rate Michelle Obama positively, and 61% say their opinion is very favorable. Positive views are also prevalent among Hard-Pressed Democrats, New Coalition Democrats, and Post-Moderns (83% of each group favorable). But misunderstandings about Obama’s birthplace are not limited to those who oppose him politically. 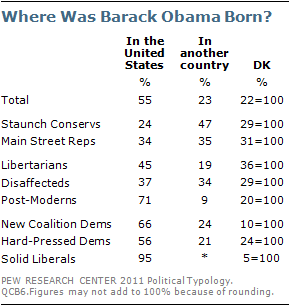 In fact, 24% of New Coalition Democrats, and 21% of Hard-Pressed Democrats also say Obama was born in another country. Only among Solid Liberals is there uniform clarity about Obama’s birthplace: 95% say he was born in the United States, and less than 1% say elsewhere. The fact that confusion about Obama’s origins exists beyond those who dislike him is apparent in the views of those who say he was born in another country. Nearly three-in-ten (29%) people who say Obama was not born in the United States approve of the job he is doing as president, and roughly a quarter (23%) say they would like to see him reelected in 2012. Not surprisingly, the two core Republican groups and the three core Democratic groups mostly confer positive ratings on their own party while rating the opposing party negatively. Though more muted, views within the independent groups also reflect underlying partisan leanings. Three-quarters or more of both Staunch Conservatives (81%) and Main Street Republicans (75%) have favorable opinions of the GOP. Views of the Democratic Party among both groups are clearly negative, but Main Street Republicans are slightly less critical (14% favorable vs. just 1% favorable among Staunch Conservatives). Within independent groups, about six-in-ten Libertarians (62%) and Disaffecteds (59%) have a positive opinion of the GOP. But just 6% of Libertarians have a very favorable opinion of the Republican Party compared with 17% of Disaffecteds. While few in either group give the Democratic Party good ratings, Democrats fare better among Disaffecteds (25% favorable vs. 12% of Libertarians). The Democratic-leaning Post-Moderns have a largely favorable view of the Democratic Party (58%), while just 25% view the GOP favorably. Among each of the three core Democratic groups, about eight-in-ten hold favorable views of the Democratic Party. But Hard-Pressed Democrats are more likely than Solid Liberals to give the highest marks to their party (36% very favorable vs. 21% very favorable). Few among any of these groups have a positive assessment of the GOP, but Solid Liberals are more negative toward the opposition party than are those in either of the other core groups.